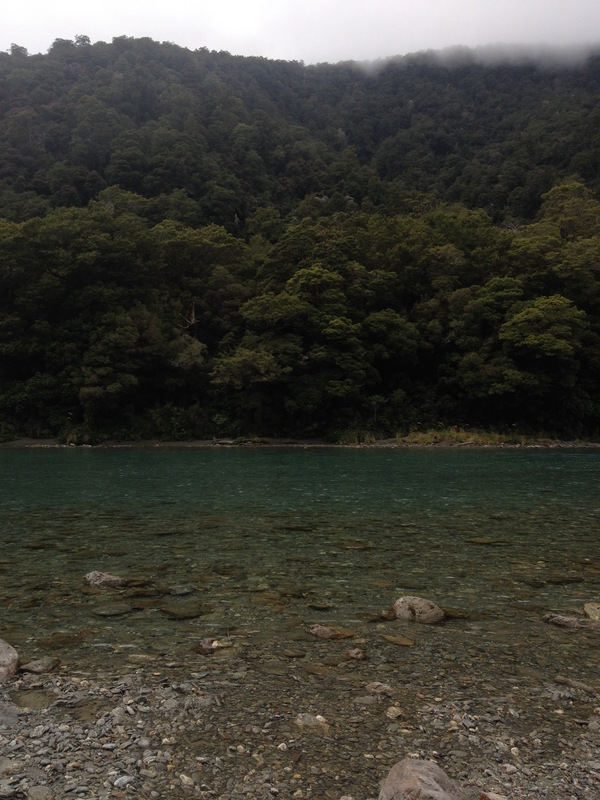 I walked through the camp ground down to the Haast River. It’s obvious to see from here, Tolkien never considered New Zealand as the setting of his stories. The water is far too clear. If someone were to drop an all-powerful ring, you’d only need to wait for the water to settle to spot it. Even if it were caught in the current, I don’t think you’d need to chase it for long. We didn’t hang around in Pleasant Flats, we got back on the road and continued our winding drive through Mount Aspiring National Park. We were heading to glacier country via the coast. 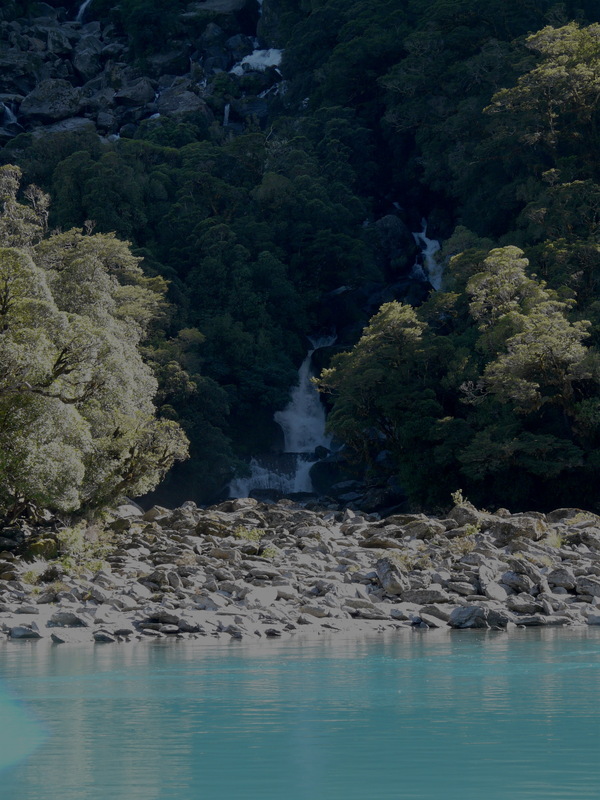 We made one stop in the Haast Pass to see Roaring Billy. The thundering crash of water was audible from the car park. We walked though a tree-fern forest, dappled sunlight painted the ground. We emerged onto a huge stretch of perfectly sculpted grey-white pebbles. The sky blue river lay beyond. The Roaring Billy falls were tucked away in the dark trees on the opposite shore. We crossed the stones to the river’s edge. Dipping our feet in at a shallow bend lined with soft grey sand. We could have stayed here for a while. As we enjoyed the sun, the cool water swirling around our ankles, another noise joined the pounding of the falls. It screamed up the river, spinning and splashing. A jet boat. Mum had been keen on going for a jet boat ride until she had seen one. You sit in what appears to be a greenhouse. I suppose all of the splashing is to help you keep cool! We went back to the van and continued onwards. We didn’t stop again until everything had completely changed. Having driven through range after range of mountains, there was almost an expectation they would just keep rising. As soon as one disappeared behind you, you were already half way up the next one. The mountains do stop. 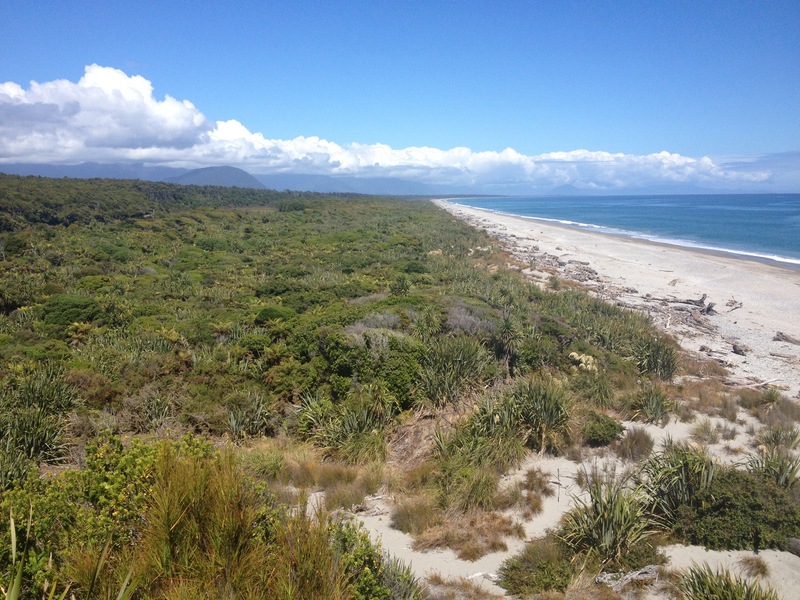 We emerged from the Haast Pass onto the west coast. There was nothing in front of us except the Tasman Sea. The whole landscape had changed as well. The greens were brighter, fresher, more accustomed to the rain. Grass actually grew on the side of the road. We stopped at Ship Creek amongst the sand dunes to walk along the beach, to feel the waves crash against our knees. 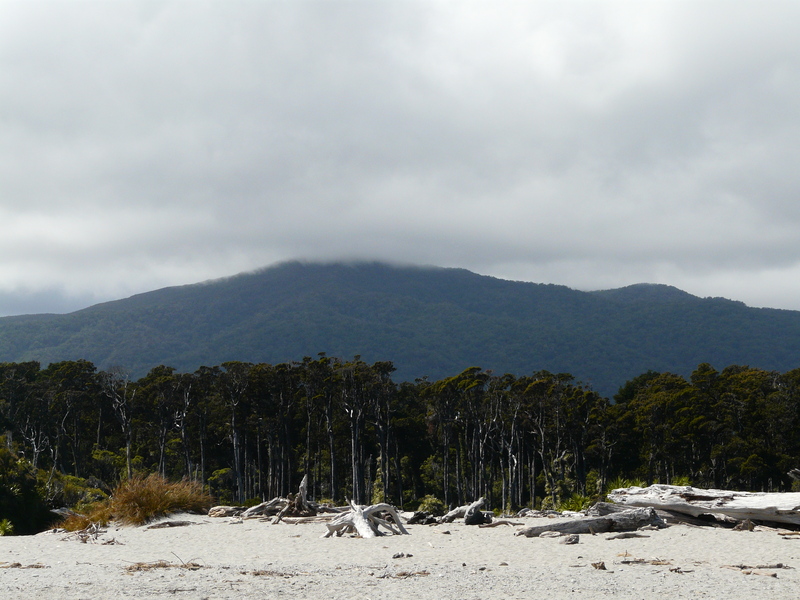 There’s a short walk through the dune forest which consists of more tree ferns for the most part. There’s a mangrove like tree but without the roots, it’s branches reach out like tentacles, battered and twisted by the wind. There was a small salt-water lake behind the dunes. Home to kingfishers, buzzards and all manner of wildlife that must have been somewhere else while we were there. Most other people who had pulled into the car park ventured no further than the beach. It feels like fish tank gravel underfoot. It’s not sand, but it’s not uncomfortable either. The grains are just small enough to give way. It felt good to be looking over the ocean. We were in for another treat. A small pod of Hector’s Dolphins appeared just beyond the breakers. There were four, maybe eight, definitely some young. 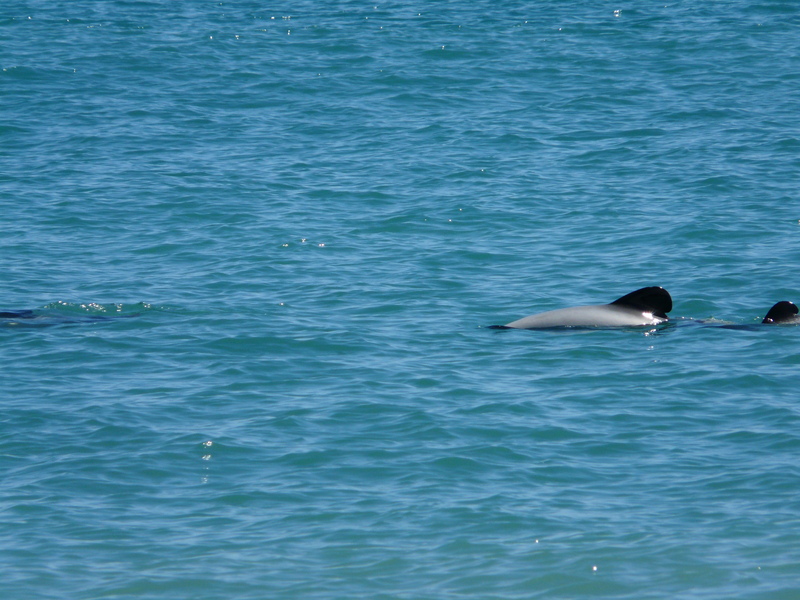 They swam with us as we walked back up the beach. I woke up in the back of the van to find we’d arrived in glacier country. 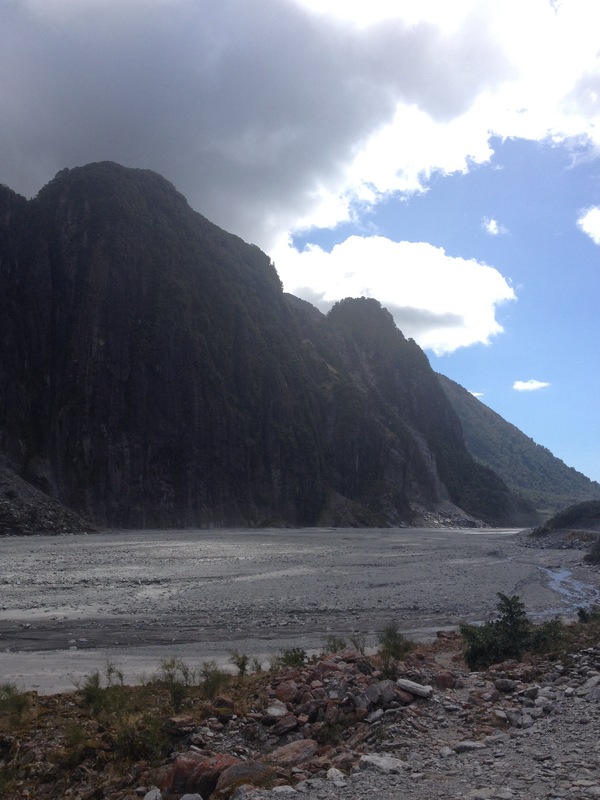 We rumbled up the unsealed road towards Fox glacier. The day kept on giving. We were in for a bit of a trek from the car park which I at least considered to be good news. Opposite the car park a cliff wall rose straight up. I don’t know how tall it is. I’d guess but I’d be way off. My sense of scale shows no signs of improving. I’m in awe. Again. The track climbs back into the mountains. There’s signs everywhere suggesting the former spread of the ice. We passed what may have previously been the viewing platform not even halfway to the current one. 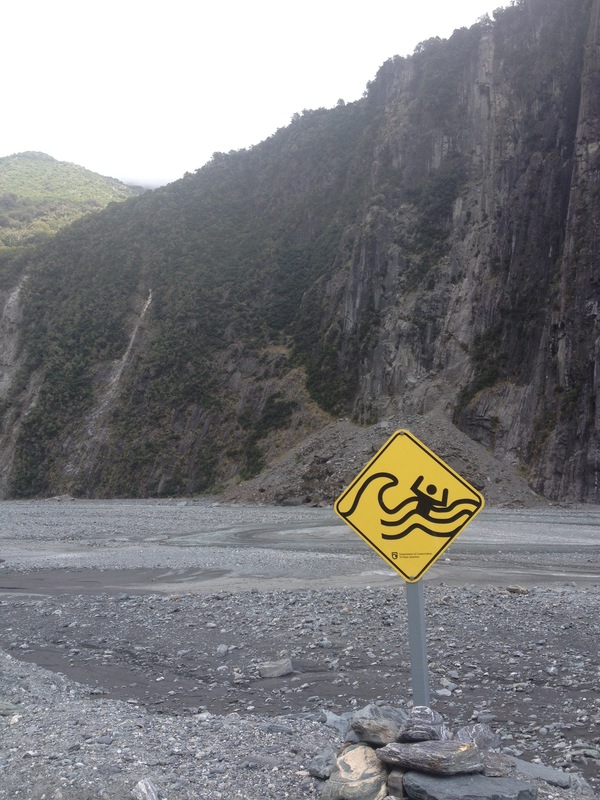 There are brilliant warning signs everywhere. Dangers of falling rock, falling ice, storm surges. There was none of this in the Southern Alps. The risk factor is not the only big difference. I was the first to reach the viewing platform. It’s not a platform, it’s just a fenced in area from which you can safely look at the glacier. A slab of white lays in the centre of the valley. Its surface looks cracked, shattered, littered with rubble. Hints of blue linger in the shadows. This is what I was expecting. This is what a glacier is supposed to look like! It wasn’t perfect though. Dad was struggling with the streams trickling down the valley from beyond the icy terminal. How could there be ice down here, if there’s water up there? Not even I had an answer for him. It did build all of us up. 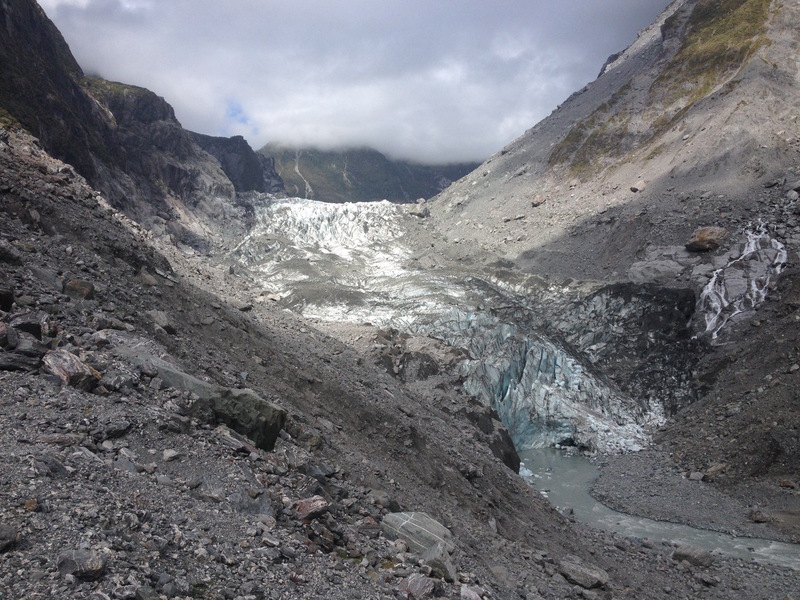 We had the exciting prospect of being up on the surface of the Franz Josef glacier next on the itinerary!